As I read through responses to my previous article ("Solving the hog problem in America"), one of the most common themes I saw over and over again was that there is a big disconnect between those who understand the severity of the situation and those who don't. Specifically, many people are lamenting the fact that they are perfectly willing to help landowners deal with an ongoing hog problem, but they do not want to pay for the privilege of doing so. Truth be told, I think this situation does a good job of illustrating how we got where we are today. While hogs are indeed prolific breeders and will spread into new areas, this fact does not completely explain how they have expanded so quickly into such widely distributed areas. Look at the map below. See all those isolated hog populations outside the southeastern U.S.? Those hogs didn't get there on their own. The spread of wild pigs in the United States. This map illustrates cumulative documented occurrence of wild pigs from 1982 to 2012 based on Southeastern Cooperative Wildlife Disease Study (SCWDS) records. Image: Conservation Science Partners. Sure, you might be able to explain away some of them as escapees from farms. However, I'd bet you dollars to doughnuts that most of those hog populations are descended from hogs intentionally released by hunting outfitters. 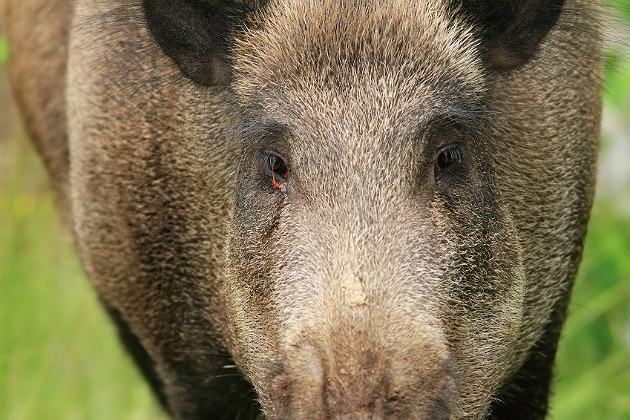 Hunting feral hogs — "Russian" or "wild" boar as they are often marketed — holds quite an allure for many hunters who have never really pursued any big game other than deer. On the surface, they also seem like a great moneymaker for a hunting outfitter: It doesn't cost that much to buy a few hogs, and their rapid breeding rate ensures the hog population quickly grows. Couple those traits with the fact that hogs are resilient animals that can thrive in a wide variety of locations, and you've got an ideal situation for a hog-hunting outfitter. Even if they are contained by a fence, it is difficult to "shoot out" a hog population on a ranch by hunting them one or two at a time. This also means outfitters can sell hog hunts for a relatively small amount of money and book a bunch of hunters each year. Don't get me wrong: I'm not trying to dump on hunting outfitters, and I'm certain hogs were not spread like that to intentionally cause trouble. However, I think this is a great example of the law of unintended consequences. Even when contained behind a fence, it virtually guaranteed that a few hogs will escape eventually. We all know it is really difficult to remove a hog population once they get established in an area, and the problems that hogs cause are well documented. In any case, what's done is done. All we can do now is move forward in an attempt to fix the hog problem that already exists. Unfortunately, the issue that really seems to be handicapping efforts to deal with the hog problem is the fact that too many landowners see hogs as an asset instead of a liability. The solution here is not to convince landowners with hogs that they should allow just any random person onto their property to hunt hogs. However, continuing to educate landowners and our fellow hunters about the problems hogs cause is vital to success. Once they see hogs as a nuisance as opposed to a fun hunting or money-making opportunity, things will become much easier all around. The next thing we can do is stop the transport of feral hogs to slow their spread. This is already illegal in some states. If it's not illegal in your state, contact your elected representatives and ask for their help with legislation to make it illegal. If transporting feral hogs is illegal in your state and you witness someone doing it, call the police or a game warden and let them know what is going on. Once we stop the spread of feral hogs by humans, we can then start to worry about controlling or even rolling back hog populations where they already exist. I'm not under any illusions that we'll be able to eliminate the hog problem in the U.S. with hunting and trapping alone. However, what we can do is keep the issue from getting worse until we can develop some more effective methods of controlling their numbers.